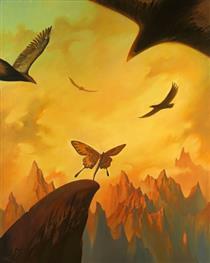 Vladimir Kush (born 1965) is a Russian born surrealist painter and sculptor. He studied at the Surikov Moscow Art Institute, and after several years working as an artist in Moscow, his native city, he emigrated to the United States, eventually establishing his own gallery on the island of Maui in Hawaii. His oil paintings are also sold as giclée prints which contributed to his popularity and led to the establishment of further galleries in Laguna Beach, California and Las Vegas, Nevada. In 2011 Kush won the First Prize in Painting at the Artistes du Monde international exhibition in Cannes. Kush was born in 1965 in Moscow, Russia. After studying at the Surikov Moscow Art Institute, he was conscripted into the Soviet Army for two years where he was assigned to paint murals. In 1987, he began exhibiting with the USSR Union of Artists but earned a living drawing portraits on the streets of Moscow and caricatures for a newspaper. In 1990, following his first foreign exhibition in Germany with two other Russian artists, he emigrated to the United States, initially living in Los Angeles before moving to Hawaii where he also worked as a mural painter for the Whaler's Village Museum on Maui. While based in Hawaii, his works received several exhibitions in Hong Kong galleries. Gallery shows followed in Seattle, Pittsburgh, and other American cities, and he eventually opened his own gallery, Kush Fine Art in Lahaina, Hawaii. He later opened Kush Fine Art galleries in Las Vegas and Laguna Beach, California. 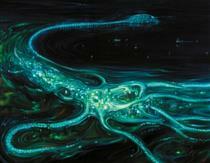 Many of his original oil paintings are also sold as giclée prints which initially contributed to his popularity. In 2007 Kush sued the pop singer Pink and her record company for copyright infringement when imagery from his painting (and later giclée print), Contes Erotiques, was used without his authorisation for her 2006 video U + Ur Hand. The case was settled the following year when the singer agreed to pay him undisclosed damages. Prints and an original oil painting by Kush are held in the NaPua Gallery collection at the Grand Wailea Resort on Maui in addition to works held in private collections. In July 2011 his works were shown at the Artistes du Monde international exhibition in Cannes where he won the American First Prize in Painting. He also has a resident show in Las Vegas, Nevada at Caesar's Palace. Kush predominantly works in the medium of oil painting on canvas or board, with many of the original paintings also sold as limited edition giclée-on-canvas prints. His bronze-colored sculptures are small-scale and usually based on imagery from his paintings, such as Walnut of Eden and Pros and Cons. Although his style is frequently described as surrealist, Kush himself refers to it as "metaphorical realism" and cites the early influence on his style of Salvador Dalí's surrealist paintings as well as landscapes by the German romantic painter Caspar David Friedrich. Another influence on his work has been the 16th century Dutch painter Hieronymus Bosch, known for his fantastic imagery and sometimes characterised as "the pre-Surrealism Surrealist". Wings, ships, and color-saturated seascapes are frequent themes in his paintings, exemplified in the companion pieces, Arrival of the Flower Ship and Departure of the Winged Ship. Flowing water is another recurrent theme, exemplified by Breach and Current. Other works such as Three Graces and African Sonata merge human and animal forms with inanimate objects. 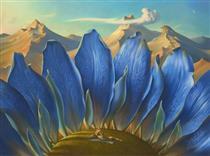 White Flowers of the Sky Vladimir Kush ? Infinity Trail Vladimir Kush ? City by the Sea Vladimir Kush ? 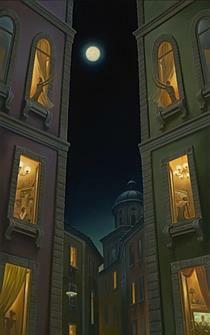 Full Moon Games Vladimir Kush ? 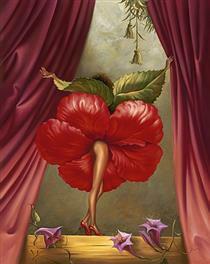 Hibiscus Dancer Vladimir Kush ? 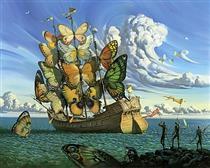 Departure of the Winged Ship Vladimir Kush ? 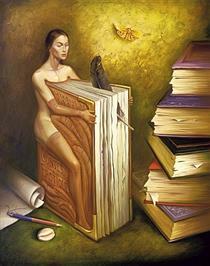 Contes Erotique Vladimir Kush ? Claws of Fate Vladimir Kush ? Across the Mountains and into the Trees Vladimir Kush ? 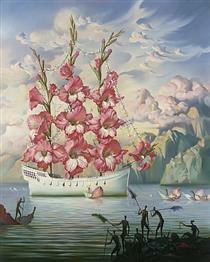 Arrival of the flower ship Vladimir Kush ?